BOTKINS — Fort Loramie ran away by halftime to secure a victory over Botkins in a Shelby County Athletic League game on Thursday. The 67-29 win wrapped up a perfect 12-0 record in SCAL play for the Redskins. Fort Loramie took an early 9-2 lead but Botkins scored the next five points to come within two points. Fort Loramie then scored the next nine to take an 18-7 lead and then outscored the Trojans 21-10 in the second to take a 39-17 halftime lead. Six different players scored in the third for Fort Loramie, which outscored Botkins 19-5 in the quarter. Kenzie Hoelscher scored 15 points and had four assists while Marissa Meiring had 12 points, a team-high nine rebounds and four steals. Dana Rose and freshman Colleen Brandewie each scored eight points. Makenna Maurer led the Trojans with nine points. Fort Loramie shot 24 for 61 (39 percent) from the field while Botkins shot 9 for 27 (33 percent). Lehman Catholic cruised to a big win over Lima Perry in both teams’ Northwest Central Conference finales on Thursday. Carly Edwards had 10 points and six rebounds while Lauren McFarland had nine points and six rebounds. Anna Cianciolo had seven points and four assists, while Hope Anthony had seven points, five rebounds and four steals. Grace Monnin had six points and nine rebounds and Rylie McIver had five steals. Minster ran away in the second half of a Midwest Athletic Conference game on Thursday. The Wildcats built an 18-8 lead by the end of the first quarter but New Knoxville used a 12-8 scoring advantage in the second to cut the gap to 26-20 at halftime. Minster outscored the Rangers 17-6 in the third, though, to put it away. Ivy Wolf led Minster with 22 points while Demaris Wolf added 10. Erin Scott led New Knoxville with 11 points. The Pirates outscored Triad 14-7 in the fourth quarter to rally and earn a nonconference win on Thursday in De Graff. Riverside led 12-6 at the end of the first quarter but Triad used a 14-7 scoring advantage in the second to take a 20-19 halftime lead. The Cardinals led 31-29 at the end of the third quarter. Shelby Giles led Riverside with 13 points and 10 rebounds. Courtnie Smith had 11 points and eight rebounds, Dana Jones scored eight points and Lauryn Sanford scored seven. Riverside shot 13 for 51 (25.5 percent) from the field and outrebounded Triad 43-26. The Pirates had 20 turnovers. Sidney’s bowling squads split a match at Vandalia-Butler on Thursday. The boys squad beat Butler 2,394-2,292 to improve to 12-5 overall and 9-5 in Greater Western Ohio Conference American North Division play. Logan Finke had a 429 series and Harrison Fisher had a 417 series. Drake Cromes had a single game of 258 and Jaxon Rickey had a single game of a 222. Sidney’s girls squad lost 1,792-1,568 to drop to 4-13 and 4-11. Sarah Bell had a 277 series, Cassie Trudeau had a 270 series and Emma Hurley had a 266 series. Sidney dropped its final Greater Western Ohio Conference American North Division game on Wednesday in Vandalia and finishes conference play winless. Butler built a 21-7 lead by the end of the first quarter and led 40-11 at halftime. The Aviators outscored Sidney 22-3 in the second half. 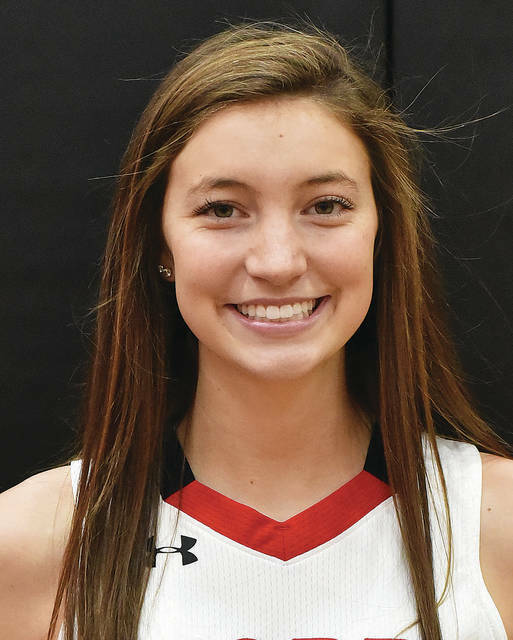 Hallie Truesdale led Sidney with nine points while Emma Wiford brought down seven rebounds. Sidney shot 4 for 28 (14.3 percent) from the field and had 27 turnovers. Riverside’s bowling squads split a match with Indian Lake on Wednesday at TP Lanes in Bellefontaine. Riverside’s boys lost 2,247-1,934. Xavier Clerico led the Pirates with a 297 series and Bailey Gammell added a 160 game. Riverside’s girls squad won 1,929-1,761. Rayce Yelton paced the Pirates with a 340 series and Kimber Waters added a 167 game.